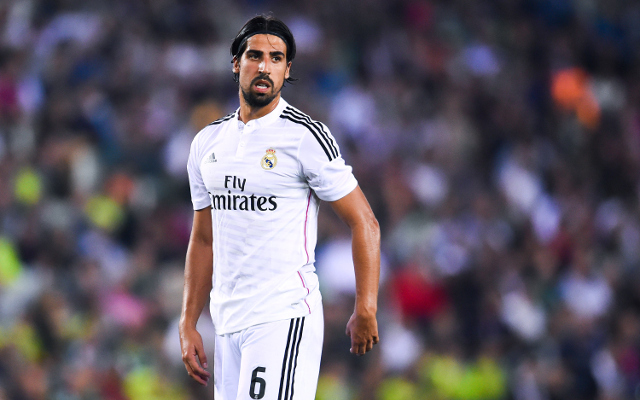 Real Madrid midfielder Sami Khedira, who has been heavily linked to the Premier League, arrived in Turin on Tuesday ahead of a medical with Serie A champions Juventus, according to reports from Italy. After four seasons in Madrid, the Germany international is on his way out of the Santiago Bernabeu this summer following the expiration of his contract with the Spanish giants. The Express report Arsenal, Chelsea, Liverpool and Manchester United have all been monitoring Khedira’s situation but according to Gazzetta dello Sport, Juventus have won the race for his signature. The defensive midfielder will complete a medical with the Champions League finalists on Tuesday, and is then expected to put pen to paper on a four-year deal worth £2.6 million per-season. A combination of a lack of form and fitness has seen his impact and playing time at the Santiago Bernabeu dwindle under Carlo Ancelotti over the past two seasons. During the current campaign, the World Cup winner has managed only three starts in the Spanish top flight. However, despite his inactivity, he hasn’t been short of offers, and his trophy record is testament as to why. During his time in Spain, the 28-year-old has won the Champions League, Super Cup, Club World Cup, Copa del Rey and the Supercopa de Espana, as well as two Liga BBVA titles.